Two for Tuesday: Layouts & Designer Papers! I decided to use the “Whole Lot of Lovely” Designer Series paper … it is soooo pretty, and I can’t believe I have not used this one yet!! 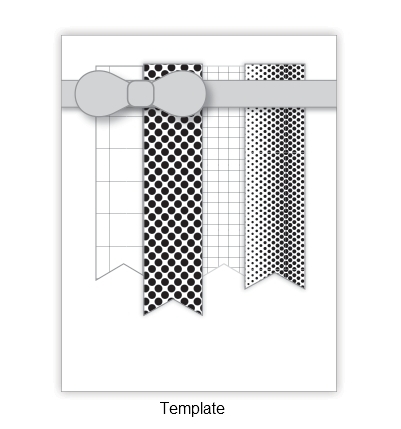 The patterns in this package work so nicely together for our banner layout. I added the “Tranquil Tide” ribbon for my bow. 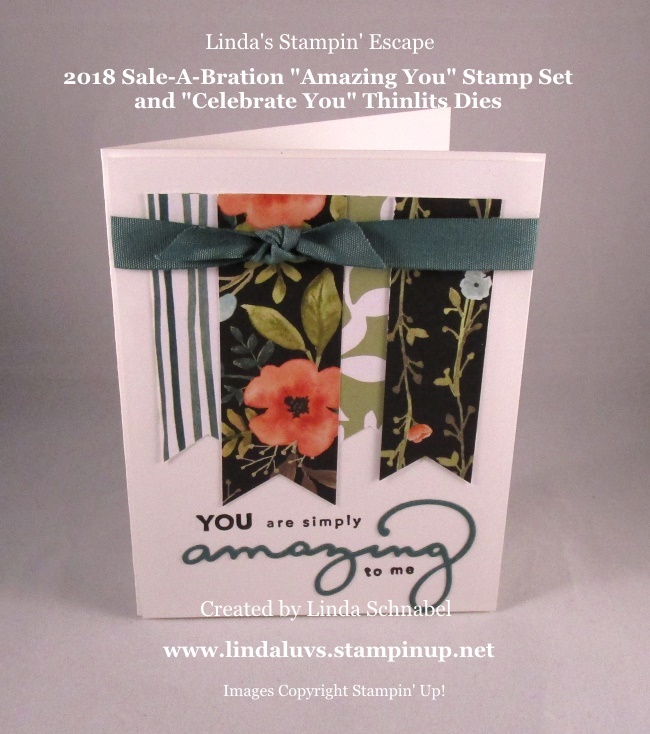 I also used the Tranquil Tide cardstock to cut out my “amazing” from the exclusive 2018 Sale-A-Bration “Celebrate You Thinlits Dies” and “Amazing You” Stamp Set! For my second card, I’ve decided to have go with a more elegant card and use the same “Whole Lot of Lovely” Designer Series paper! 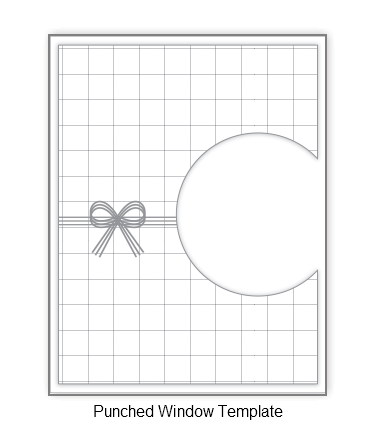 Simplicity at it’s finest … the core of your card is a 4″ x 5-1/4″ sheet of designer paper. 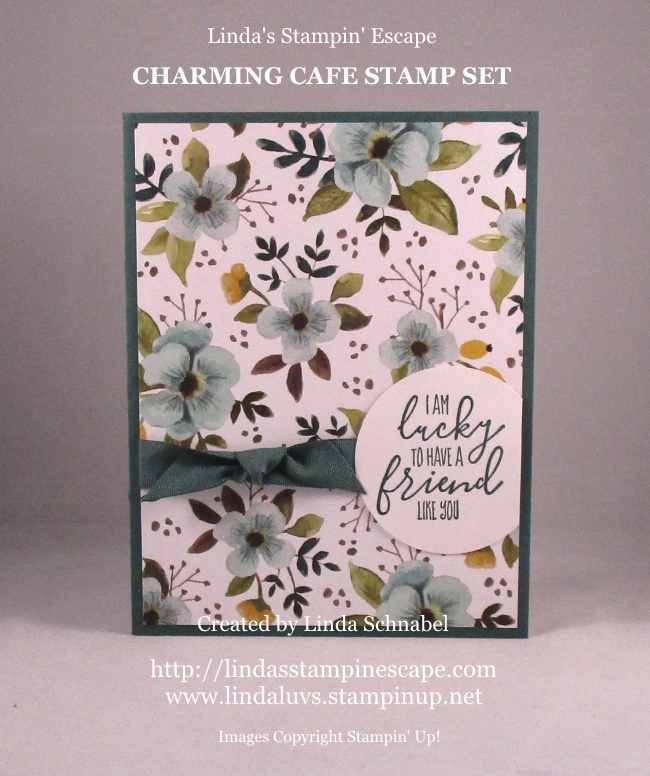 My greeting comes for the beautiful “Charming Café” stamp set found in our Occasions catalog and punched out using the 2″ Circle Punch. Again … our bow was created by using the Tranquil Tide Ribbon. 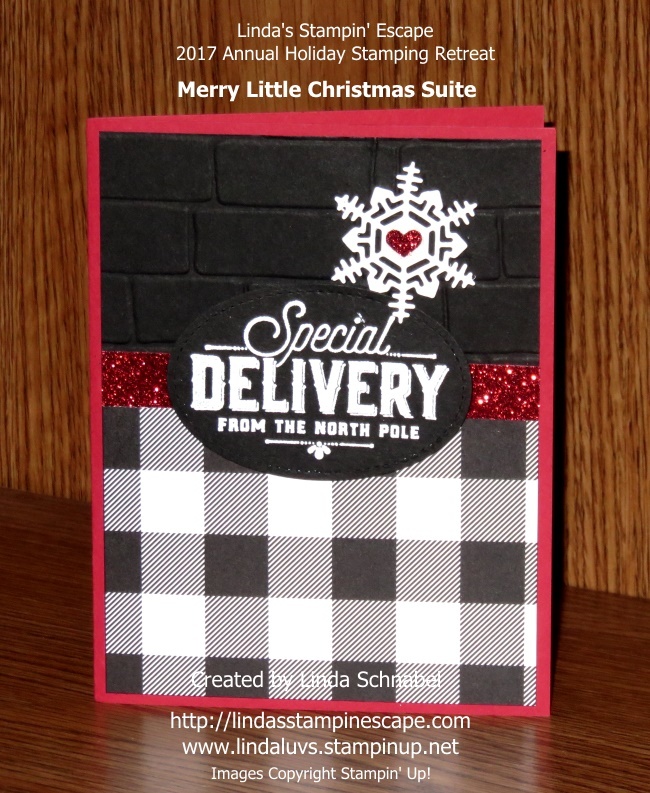 Your card making can be so easy if you use simple layouts and use our designer papers to create with. Hope you enjoyed today’s “”Whole Lot of Lovely” Designer Series paper used on two simple layouts. Thanks so much for joining me today. Enjoy! The new year is just days away! Prepare to say hello to 2018 . . . and goodbye to the Year-End Sales Event. Before we say farewell to special year-end savings on January 2, I want to remind you that supplies are limited, so take one last look at the items still available in our online store. You wouldn’t want to head into the new year with any regrets, after all! December has flown by, and there are just a few days left for you and your customers to reserve your Stamparatus before the final reservation window closes on Saturday, December 30 at 11:50 PM (MT). Remember, this fantastic, state-of-the-art stamping tool will not be available again until the new annual catalog goes live in June. So don’t wait another minute! Find out more here, then reserve your Stamparatus today! and I will see you tomorrow! Stay warm, it’s cold out there!! Happy New Year, everyone! The Paper Pumpkin team is especially excited for 2018, and we have two great reasons: (1) This year’s kits are amazing; (2) We’ve decided to kick off 2018 with a superfun giveaway. We’re calling it the Red Box Challenge, and it’s easy to get in on the fun! 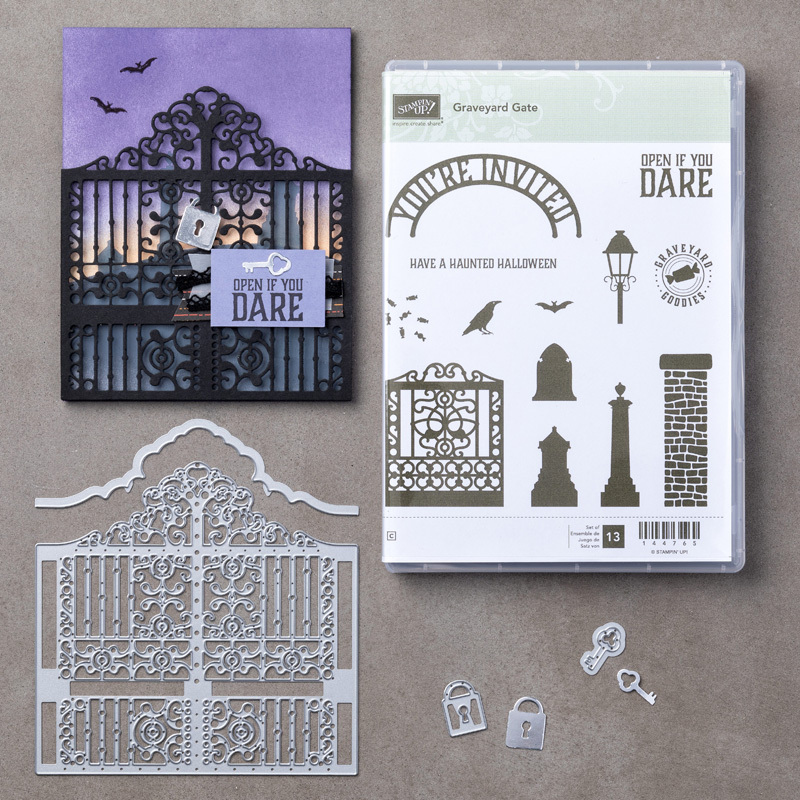 Now, we think all of our kits are wonderful and amazing–but our random drawing winners will receive the upcoming Paper Pumpkin fifth anniversary March kit. Think: Gorgeous and collectible. Everyone is going to want one. AND the winners will get it in their mailbox before anyone else. Sound fun? Check out the terms and conditions, then start crafting your Red Box Challenge project today! 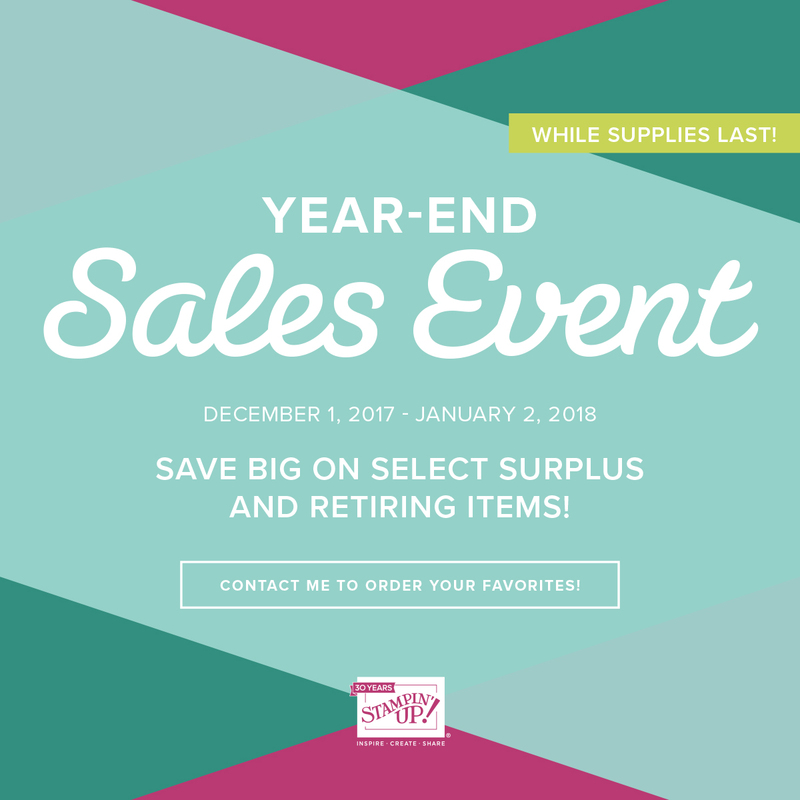 Before we say farewell to special year-end savings on January 2, remind your customers that supplies are limited, so they should take one last look at the items still available in our online store. You wouldn’t want them to head into the new year with any regrets, after all! 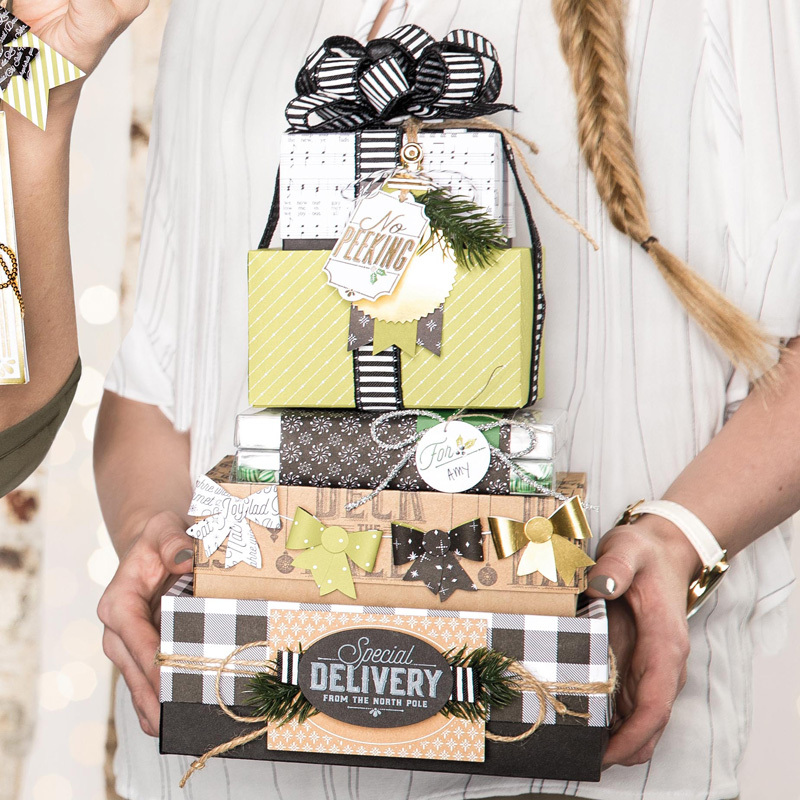 Let’s begin with one of my favorites things … Gifting!! 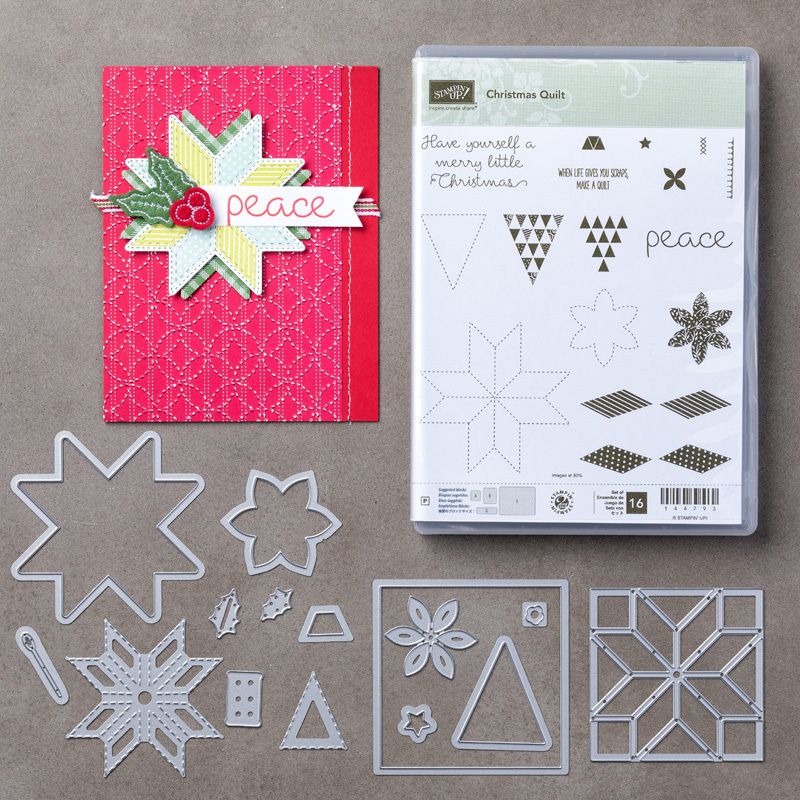 Wow … there is a lot that you can create with this one little stamp set! 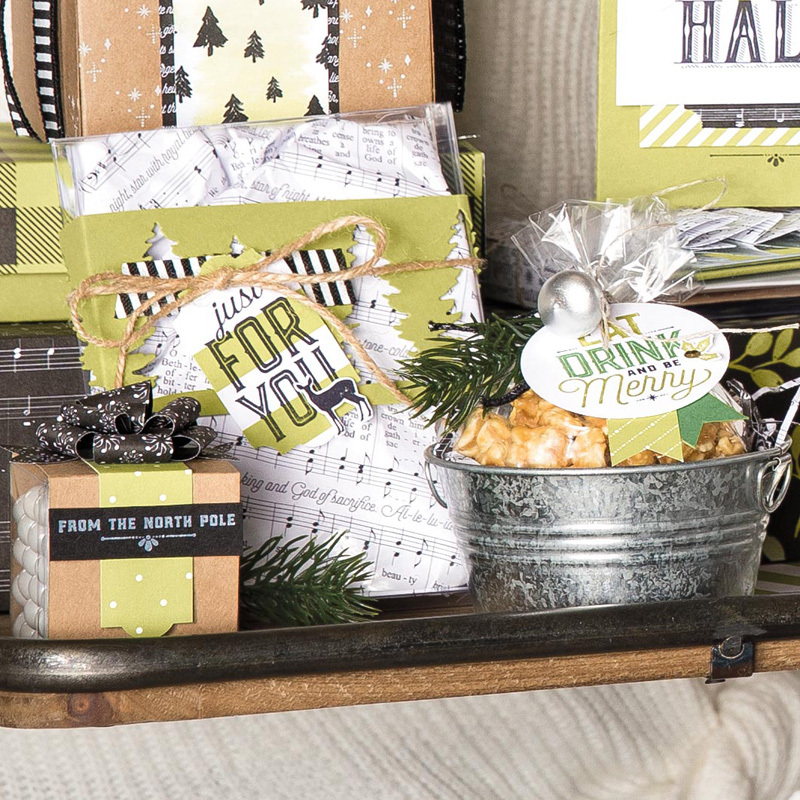 It is part of the Merry Little Christmas product suite found on pages 10 through 13 in your Holiday Catalog! I hope your day is full of gifts, the smallest are the most precious … like smiles, and babies ❤ Have a wonderful day. 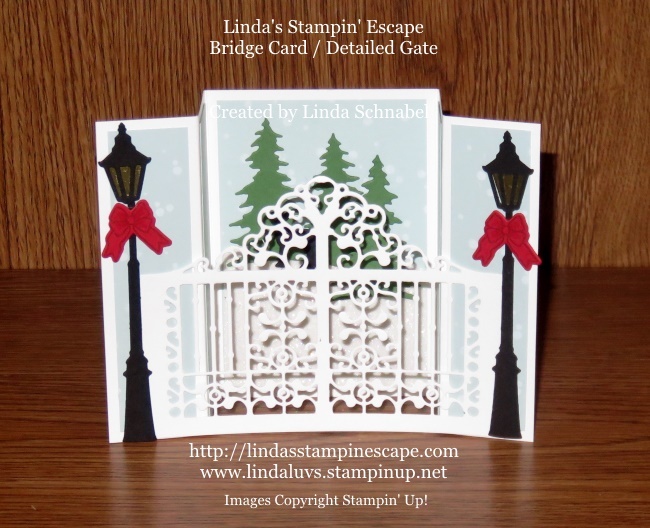 As promised … I’m back to share the “Bridge Card” that my Stamp Club members made this month! I picked 2 of my favorite bundles to create this amazing card, the Brightly Lit Christmas, Carols of Christmas and added the Detailed Gate as my bridge! My color pallet consists of Whisper White, Soft Sky, Basis Black, Garden Green and a pop of Real Red. 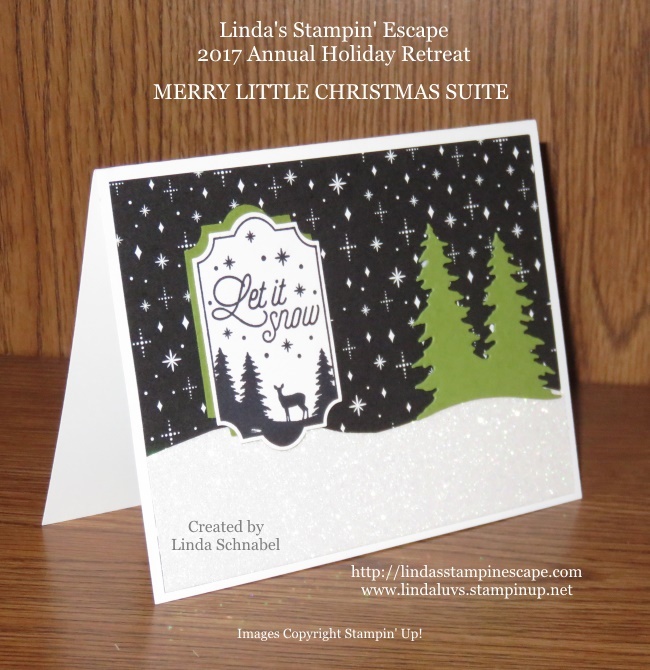 We used the little spots stamp from Brightly Lit Christmas to create snow on our Soft Sky background. 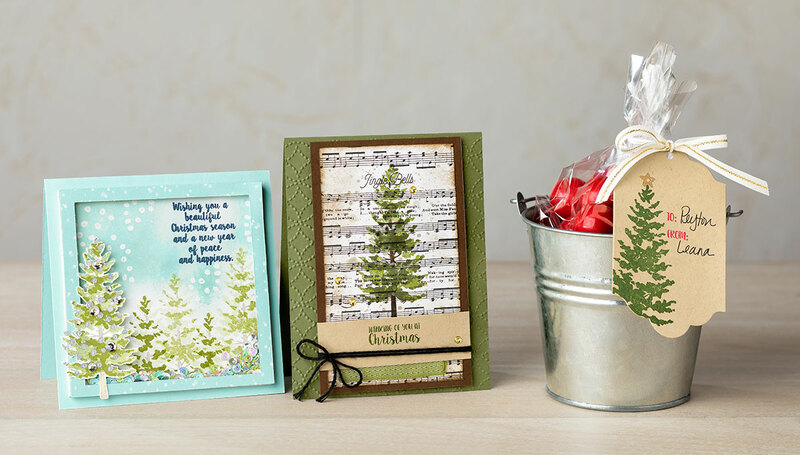 The trees are from the Cardfront Builder Thinlets Dies from the Carols of Christmas Bundle (same with the deer). Since the gate is not wide enough to reach the ends of the card … We used the lamp posts to anchor the card and hid the seam of the gate. I’m pretty proud of this card … and I love the look of the gate as my bridge. Simple to create and it folds down to slide right into your envelope! Could this be any cuter? 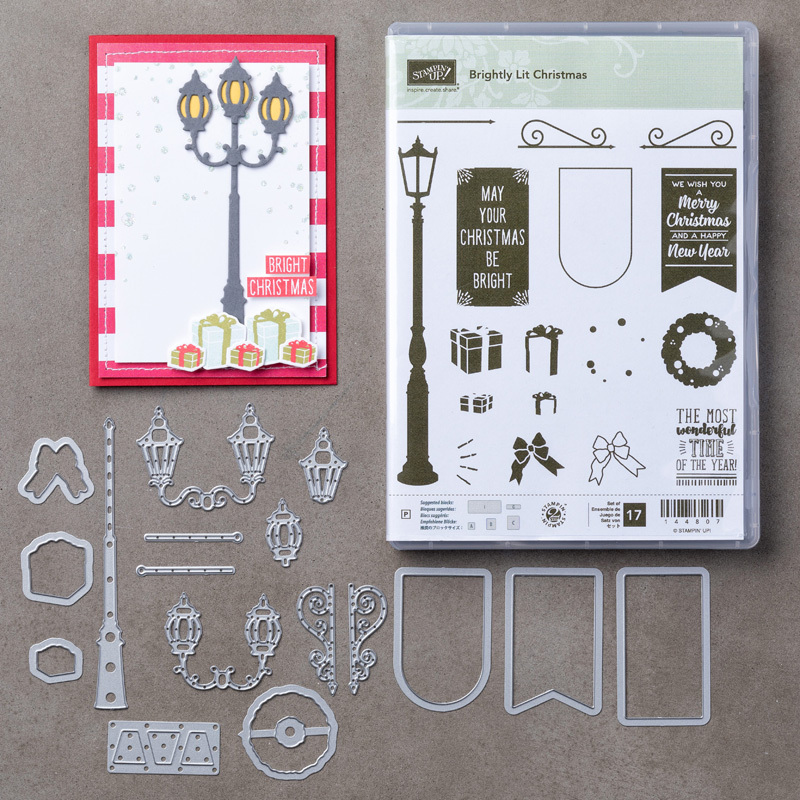 The Be Merry Kit produces beautiful rosettes with all materials included in the kit to create 12 designs. 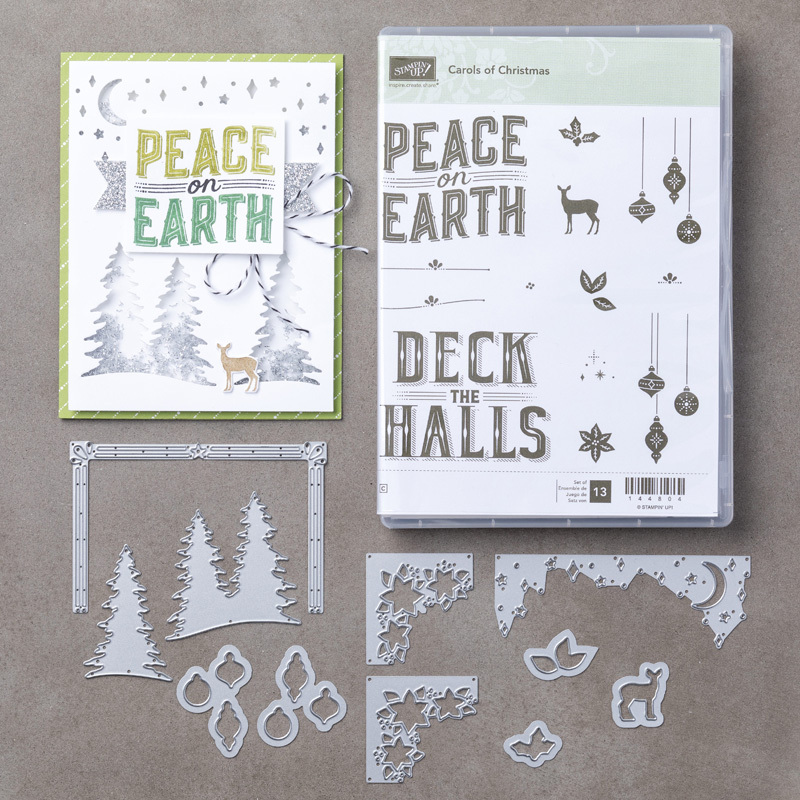 You will adore this kit and the ease with which you can make ornaments, gift tags, décor, and more. Make the season merry with festive rosette ornaments that you can hang on your tree or wreath or use as gift tags or on packages. This all inclusive kit makes 12 rosettes, 6 each of 2 designs. Rosettes are prescored and folded for quick assembly. 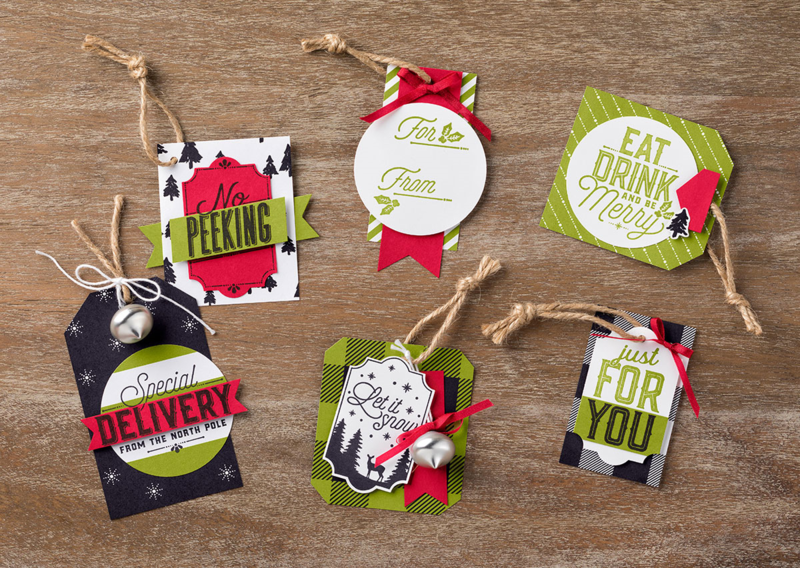 I’m using mine as tags on packages! Just write in their name instead of stamping the greeting! Then they will have a keepsake ornament for the tree next year! Thank you for checking out my blog today! Stop back tomorrow and see the amazing “Gate Card” that my club members made this month!